Magento is an open source eCommerce software that is available as a free download. The new version has a great many new features and has strengthened its foothold. There are many different versions available of Magento, however the others are not free. This also includes the cloud version with many additional features. Magento was released fairly recently compared to the others which have been around since long. In spite of this, Magento is already one of the most popular eCommerce software available. Almost every Web Development company will have a Magento demonstration link that they can share with you. This website will be a sample eCommerce store with all the common features like product listing, product page, checkout page and the payment page. Besides which, a demonstration website will also display all the additional features of Magento. Magento has several plugins available and it is also possible to develop customized plugins to cater to specific needs. The demonstration website will most likely showcase a few popular plugins and also have a brief mention about customized plugins. A Magento demonstration website will consist of the front end and the back end. The front end is the website store which will be visible to all the visitors and is where all the products are displayed. Here it is possible to check all the features of the website from the perspective of the customer. Although the template can be different for every website it is possible to have a look at the feature and widgets that make a Magento website appealing to the customer. The front end will allow you to go through the entire process of searching for a product, go through the product listing, check the product page and profile pages, and even go through the checkout page and make (fake) payment to buy the product. Doing this allows one to check the ease of use from product selection to product checkout and showcase how smooth the process is. The demonstration website will also have a back end, which is the administrative panel. The administrative panel allows the store owner to manage the website. Hence, it is possible to check all the features that Magento has to offer from the basic features like adding products, managing orders, processing payment to the advanced features that Magento has to offer. Magento has a lot features and some are hidden deep in the configuration menu, hence these demonstration websites make it possible to explore all the features. It is also possible to install plugins in Magento and this can be seen from the Magento back end. The front end is where these features will be visible to the customer. The custom features may be tagged in the front end and back end, hence making it possible for you to get a better idea of what extensions can be made to a Magento eCommerce website. A Magneto demonstration website is a good way to check all the features that it has to offer and decide on whether it is right for you. Alakmalak is involved in Magento Web Development and has many skilled and experienced Magento developers for the task. These developers use the state of the art resources at their disposal. 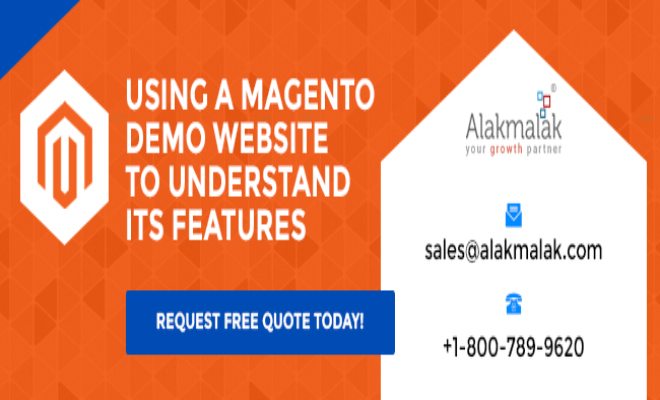 Hence, if in need to Hire Magento Developer in India, Alakmalak is the best option.